AAA Northern New England’s “Slow Down, Move Over” Public Service Announcement Recognized with Granite Mikes PSA of the Year. AAA Northern New England is honored that the New Hampshire Association of Broadcasters recently recognized AAA’s Slow Down Move Over PSA with the 2016 Granite Mikes Award for “Public Service Announcement of the Year” at the 2016’s New Hampshire Association of Broadcasters Granite Mike Awards, held last week. An estimated 200 roadside workers, law enforcement officers, firefighters, tow truck drivers and EMTs are struck and killed in the United States by passing traffic. Countless more are injured. 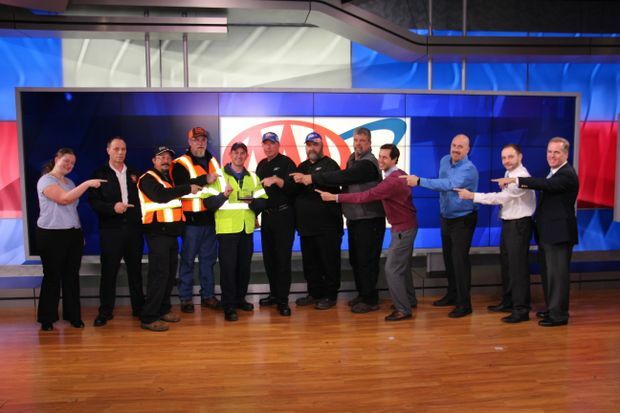 To help raise awareness of the need to slow down or move over, AAA Northern New England worked with the New Hampshire Tow Association, Concord Police and Fire Department, the New Hampshire Department of Transportation, New Hampshire State Police and NH1 to produce the award winning segment. “To be recognized for creatively promoting safety for highway workers who risk their life every day to help the public is an honor that will help improve awareness of the highway safety message,” said Pat Moody manager of public affairs for AAA Northern New England.